After nearly two decades of working with growing-season burns, Alan Isler knows the short- and long-term effects. Isler, a DNR wildlife resource manager and former Georgia Forestry Commission employee, has seen five years of controlled burns free Doerun Pitcherplant Bog’s pine savanna from hardwoods that had invaded the once open habitat. 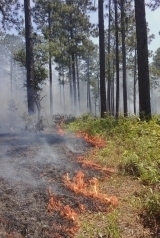 Yet, when he sets the next prescribed fire at the Colquitt County natural area or Silver Lake Wildlife Management Area near Bainbridge, he will also see almost immediate results. “Within three to four days, we’ll have lush green vegetation out there,” said Isler, who works with the DNR's Wildlife Resources Division. Growing-season fire sounds like an oxymoron. Applying fire when plants are growing, not dormant, is good? For Georgia habitats and wildlife that evolved with what some call summer fire or lightning-season burns, the short answer is very short: Yes. Julie Robbins, southwest Georgia supervisor for the Wildlife Resources Division’s Game Management Section, describes growing-season burns as a critical component of managing upland game birds on WMAs in her region such as Silver Lake, Mayhaw, Chickasawhatchee and River Creek. In 2011, nearly 4,300 acres was planned for growing-season fires on land the Wildlife Resources Division manages. The goal this year: Increase that by about a third, not counting other public or private sites burned. The Interagency Burn Team, which includes DNR and partners such as The Nature Conservancy, U.S. Forest Service and The Orianne Society, recently set a weekly growing-season burns record for the team: 1,785 acres. For the season, which started April 1, burns have been applied to sites ranging from Clarks Hill WMA to Reed Bingham State Park. 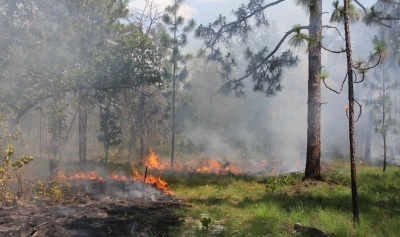 Highlights include burning rare chalk prairies at Oaky Woods WMA (video); gopher tortoise habitat at Reed Bingham State Park; 570 acres of longleaf pine habitat at Moody Forest WMA and Natural Area; and habitat for Henslow’s sparrows at Paulk’s Pasture WMA (with Plum Creek’s help) and endangered red-cockaded woodpeckers at Silver Lake WMA (pictured at right) (also see “Silver lining for rare woodpeckers,” May 25, 2012). Evidence of growing-season fires is found in fire scars of old stumps that show the tree’s history. Research shows that many ground-nesting birds such as turkeys prefer recently burned areas and can re-nest if they lose their first nest to fire, allaying concerns about negative impacts. Did you know … Tallulah Gorge State Park, where a 720-acre dormant-season burn was done this year, is a Southern Blue Ridge Fire Learning Network demonstration site, making the Northeast Georgia park a platform for learning about fire in the mountains. Georgia DNR foiled an alleged attempt to poach sea turtle eggs from nests on Sapelo Island last month. Using a dog trained to sniff out wildlife, Wildlife Resources Division officers checked the baggage of passengers leaving Sapelo on the island’s ferry May 27. The dog, named Gauge, “alerted” on the suspect’s duffel bag. Officers opened it to find 156 sea turtle eggs packaged in plastic bags (eggs pictured at left). Sea turtle eggs are prized by some as a purported aphrodisiac and a food delicacy. Yet, all sea turtle species that nest on Georgia beaches are protected by state law and the federal Endangered Species Act. Potential penalties for a person possessing their eggs include up to a year in jail and a $100,000 fine. The U.S. Fish and Wildlife Service is investigating the incident. DNR officers involved in the case – the first such case Capt. Doug Lewis said he could recall in Georgia – included Ranger Jeremy Reese, Cpls. Chris Ridley and Jimmy Finn, Sgt. Wayne Hubbard and Ranger 1st Class Tim Hutto, handler of Gauge. Sea turtle nesting continues full tilt on Georgia beaches. Through June 12, 817 nests had been marked, 813 of them from loggerhead sea turtles. It’s too early to tell if this year’s early start for loggerheads – the first nest was found April 25 on Cumberland – will lead to a summer that tops last year’s 1,992 loggerhead nests, the most since comprehensive surveys began in 1989. Click for the latest counts. Beryl also brought a surprise: a Kemp’s ridley nest on Ossabaw Island! 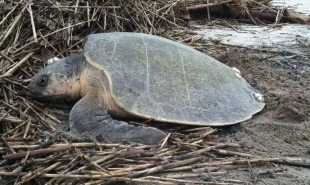 The turtle (above), found and photographed by DNR technician Jessica Thompson, was only Georgia's second documented Kemp’s nest (the first was on Wassaw Island in 2005). This nest was relocated to avoid tidal inundation. Dodd said Kemp's ridleys nest primarily on beaches in the western Gulf of Mexico, and normally on stormy days in a large group called an arribada. This nest is considered an anomaly. Because it's so far from the species' known nesting range, it's considered unlikely that any young that survive would return to nest on Ossabaw. Watch this 1947 video of an estimated 40,000 Kemp's ridley turtles nesting! If you’re like me, you are constantly on the lookout for plants that add beauty to your landscape and benefit your wildlife neighbors. One such plant is the butterfly weed. I know what you’re probably thinking: The last thing I need in my yard is another weed! Please don’t judge this plant by its name. I assure you this is not another Johnson grass or kudzu. 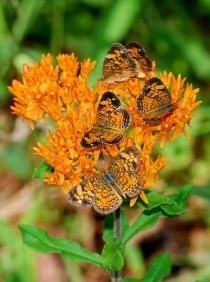 And if you give butterfly weed a chance, it will be a cherished addition to your home landscape, attracting hummingbirds and serving as a veritable magnet to butterflies. … Read more! Terry Johnson is a former Nongame program manager with the Wildlife Resources Division and executive director of TERN, the Nongame Conservation Section’s friends group. His “Out my backdoor” columns are archived here. Sheila Humphrey, wildlife interpretive specialist at Smithgall Woods Regional Education Center near Helen, has been named Georgia’s 2012 Project WILD Facilitator of the Year. Sheila and nine other specialists across the country were recognized for their outstanding service as they trained educators about wildlife management. The public is invited to watch as the Southeastern Raptor Center and DNR return a bald eagle to the wild at Paradise Public Fishing Area on Saturday, June 16. Staff caught the injured 2- to 3-year-old eagle at the Berrien County PFA in March, and the Raptor Center at Auburn University rehabilitated it. A female peregrine falcon nesting this spring in metro Atlanta fledged two years ago from a New Hampshire nest, making her journey possibly the longest recorded dispersal for a nesting peregrine. The Atlanta nest, near Perimeter Mall, is the third known peregrine nesting territory in the metro area. Batty about bats? Then consider volunteering for a summer survey starting this month in Georgia to collect acoustic data on bats, part of a long-term, nationwide effort to better monitor bats. Details and instructional video at www.georgiawildlife.org/AnabatProject. White-nose syndrome has been confirmed in gray bats in Tennessee, a first for the species federally listed as endangered. The disease first documented in New York in 2006 has since killed millions of bats and spread to 19 states (but not Georgia) and four Canadian provinces. More than $107,000 has been collected in fees via the Georgia Outdoor Recreational Pass. Aimed at funding much-needed maintenance projects on 32 Wildlife Resources Division properties, GORP has resulted in $78,000 in completed repairs, with more in the works. Campers can help combat the spread of the emerald ash borer and other non-native pests and diseases by using only firewood cut and purchased locally. Details from the Georgia Forestry Commission and Don't Move Firewood. The weird-looking shell of this spiny softshell turtle (right) fished recently from the Flint River near Fort Valley is probably the result of a birth defect called kyphosis that caused the curved spine. Even weirder: A similar softshell from a pond in the Perry area was brought to the Go Fish Education Center only a few weeks before, Education Program Manager Jerry Wixson said. Terrific Turtle Tuesdays are scheduled through July 31 at the Go Fish Education Center in Perry. The 10 a.m.-2 p.m. every-Tuesday program centers on showing “Turtle: The Incredible Journey,” an award-winning film that follows the life of a loggerhead sea turtle. The holly found a few years ago on Brasstown Bald is Ilex collina, the first known occurrence of long-stalked holly in the state. Botanists, including from the Nongame Conservation Section, confirmed the species after finding immature fruits on the plants last month. Conservation training and partner highlights were part of a recent Forestry for Wildlife Partnership meeting involving staff from the Wildlife Resources Division, U.S. Fish and Wildlife Service and corporate landowners Georgia Power, Plum Creek and Wells Timberland. "Snakes on the move as weather warms," Rome News-Tribune. More coverage: Newnan Times-Herald, The (Dalton) Daily Citizen, Coastal Courier, The (Gainesville) Times. Check out our 2011 annual report.